Jim Olthuis’s exaugural address on creation as an act of love, "Creatio Ex Amore," opened our hearts to knowing love as having no boundaries. When all creation flows from love, love must flow to all creatures. 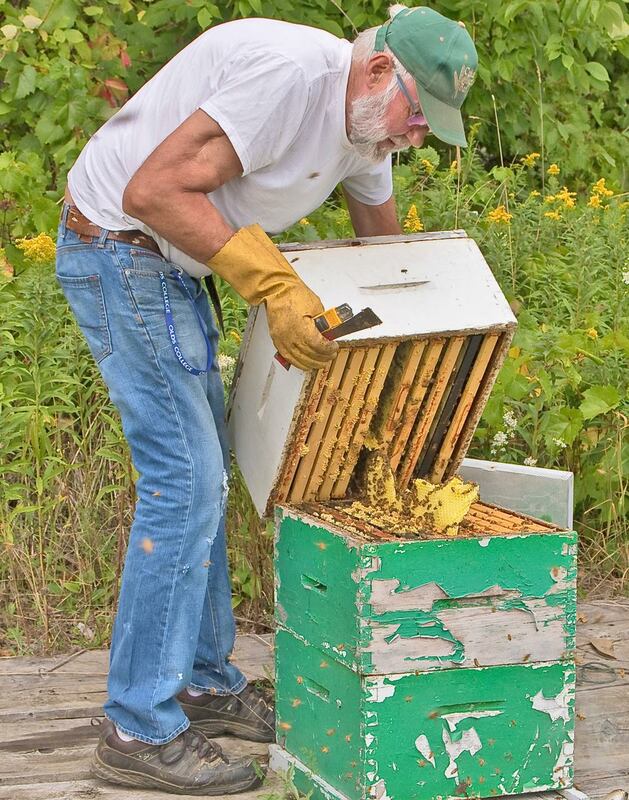 The bee keeper shows us how. Last week’s blog briefly told the story of how, really for the first time, hitherto unknown love became a reality in our lives virtually overnight. This week I share how after some years I wrote down briefly, as a marker, what the presence of love/Love had come to mean in my life. After love/Love exploded in our lives while waiting for death, I was powerfully drawn to search for the meaning of love and Love. I now know that, at its core, a human life gains immeasurably in depth and scope when it is exposed to giving or receiving love as the primeval energy of all that is. Once we begin to be in the embrace of Love and begin to experience ourselves as vessels of love (I mean: to BE), we become aware of an irresistible energy that compels us to become centered, in all we do, in that embrace; to seek for ourselves and others peace, justice, joy, life, fulfillment, patience, hope, life and much more. Love then begins to guide us in setting our priorities, distributing our energies, choosing our relationships, valuing our involvements and in so doing fills us with a blessed awareness that whenever and wherever we follow this guidance we find that, step by step but irresistibly, darkness recedes and light spreads. We become driven by a Spirit (Ruah, Wind, Breath) that blows where it wills and that without exception harvests light and life wherever it blows. The more we trust the Presence of Love in our life the more we ourselves become a presence of love in that Presence. I have experienced that Love dawns (!!) most forcefully when I lived at the edge of the abyss of darkness. In Esther's and Anita’s last journey the doom of death revealed unknown depths of Love. This experience has started in me a steady meditation on two meanings of death, as the ultimate concentration of evil and as a normal stage in the course of all that exists. And at this time I am inclined to see the two meanings used as a metaphor for each other. Death can then be a metaphor for the concentration of all evil as experienced in our final separation from self and other. But the other sense then seems to persist in us in our ineradicable persuasion that new life emerges for all of us after our death. Not only do daisies bloom another spring, so do we. And so strong is this persuasion that we interpret our death as a unique event, not occurring in eternally circling cycles, but happening only once: we die and then live forever. So when we experience the birth of love in our life, we can feel that as foretaste of eternity: once this inexpressible joy will be ours forever. Ever since Esther's death I have struggled with "hereafter." Slowly an awareness has ripened in me of our "future life" as inaccessible to our understanding, but felt as a compelling reality, especially when anticipated and celebrated in music. The tears that well up when we sing of visions of redemption, reconciliation, resurrection, and rebirth speak to me not as the left-over remnants of a childish faith, but as a final maturation of our trust of Life and Love. In God's world our tears of weeping trickle into rivers of joy. This is truly a remarkable set of reflections, Henk. Thanks for offering them.